"One of the things we get into at Nasa is we run around and call things by technical names and acronyms," project manager Skip Hatfield said. "This allows us to have an identity that we can use." Orion is named after one of the brightest, most familiar and easily identifiable constellations of stars in the sky. The name surfaced on a website last month, but Nasa was trying to keep it out of general circulation until 31 August, when it plans to select either Lockheed Martin or Northrop Grumman/Boeing to build the spacecraft that replaces the shuttle fleet. US astronaut Jeff Williams, floating 354km (220 miles) above Earth at the ISS, was taping a message in advance for the space agency that was transmitted accidentally over space-to-ground radio. "We've been calling it the crew exploration vehicle for several years, but today it has a name - Orion," he said. Orion will be 5m (16.5ft) in diameter and have a mass of about 25 tonnes. Inside, it will have more than 2.5 times the volume of an Apollo capsule. The spacecraft will return humans to the Moon to stay for long periods as a testing ground for the longer journey to Mars. The vehicle will be capable of transporting cargo and up to six crew members to and from the International Space Station. 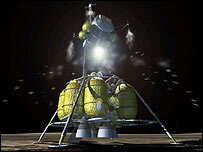 It can carry four astronauts for lunar missions. Later, it is expected to support crew transfers for Mars missions. Orion borrows its shape from the Apollo capsules of the past, but Nasa says giant leaps have since been made in computer technology, electronics, life support, propulsion and heat protection systems. 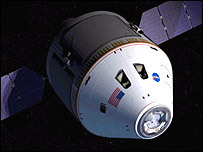 Nasa considers the capsule's conical shape to be the safest and most reliable for re-entering the Earth's atmosphere, especially at the velocities required for a direct return from the Moon. The crew exploration vehicle will replace the space shuttle programme after it comes out of service in 2010. Earlier this summer, Nasa announced the names of the rockets that will propel into orbit the crew exploration vehicle and a cargo vehicle. These launchers will be called Ares I and Ares V respectively.